The legalization of Marijuana farms and dispensaries, for medical purposes or otherwise, is a growing trend throughout the United States. These businesses, where legal, are heavily regulated and licensed by state and local authorities. 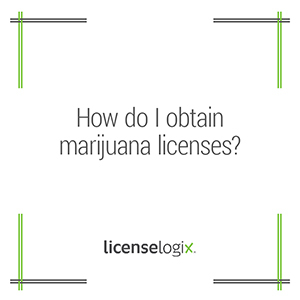 Licensing for marijuana businesses is a movement that LicenseLogix is researching and tracking. Marijuana Legalization in the United States has been achieved by a voter initiative in both Washington and Colorado. These states have developed licensing rules and regulations for the creation of marijuana cultivation farms and dispensaries. Licensing fees can range anywhere from $1000 per site to over $10,000. Cities and counties may have different regulations for farms and dispensaries, such as the amount of plants they may grow and patients they are allowed to service. In 2014, a number of States are in the process of introducing full legalization bills. Additional voter initiatives appear on many ballots in 2014 and 2016. As these states begin the legalization process, licenses will become available to the public. Many states have awarded these licenses in a “lottery” fashion. Some states have placed caps on the number of licenses awarded to farms and dispensaries throughout the state. In order to have the best chance of obtaining a license, prospective businesses must track changing regulations and begin the application process as soon as possible. Licenselogix can help with all city, county and state license filings and registrations. Licenselogix will ensure that your dispensary or farm stays compliant will all license requirements and renewal dates. Our ongoing compliance service (CLiC) can help you keep all your licenses organized, safe, and accessible in our online database. Get started today by requesting a quote or calling us at (800) 292-0909.